The phrase, 'boutique brewery', fortunately never caught on with the beer drinking public. It was one of the few misfires of beer writer Michael Jackson. Unfortunately, 'blog' —a truly ugly neologism— has become standard parlance for a 'web log', that is, a journal published on-line. Such as this one. The Blogtoberfest happy hour (which admittedly sounds way more fun than “planning meeting”). Throughout the month of October we’re getting local bloggers, foodie and non-, to share their beer stories on their own blogs. Cross-linking and conversation will ensue. Meet at 6:30 p.m. [Wednesday, 30 September 2009] at Axis Bar and Grill [in Washington, D.C.]. Across the Potomac River, at the same time tonight,, northern Virginia Twitter-ers will be Tweeting-up (aargh, these Twitpuns) at the Dogfish Head Alehouse in Chantilly, Virginia. NoVA Tweetup at Dogfish in Farifax, VA Sept 30 6PM, because DC's a pain in the rear. Well, I don't know if DC has a monopoly on that affliction. Traffic along the Rt. 50/I-66/Rt. 28 corridor can be quite the slow-moving ache in the arse. Here's a (very) short list of other blogger associations in the Washington D.C. area. C.R.A.B.B. is a loose confederation of beer bloggers in Washington, D.C., Maryland, and Virginia. I'm a member. We've never had an actual meeting, but we share a common agenda. 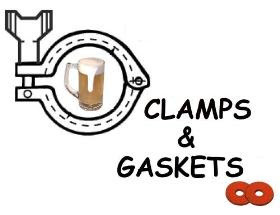 We blog about beer issues in general and those of particular interest to readers in the tri-state area. The acronym stands for Chesapeake Region Alliance of Beer Bloggers. Read more here. The Washington DC Blogger Meetup is a eclectic group of group of bloggers and micro-bloggers. We meet on the third Wednesday of every month in Adams Morgan for a casual social gathering. Join us as we write about current trends in the DC blogosphere and explore venues inside the beltway. Our “communal blogging events” or CBEs are first-person experiences of events, such as street festivals or museum exhibits, that happen in and around our city. DC Blogs is an aggregator of blogs in the Washington, D.C. area. Things look as if they are finally coming together for Birch & Barley/Churchkey. Originally slated to open in April of 2008, but delayed by various building and legal snafus, this Washington D.C. beer bar and restaurant may soon be more than a promise. Three web presences popped up today: a site for the restaurant Birch & Barley, a site for the accompanying same-building beer bar Churchkey, and a blog written by Greg Engert, beer director for Rustico in Alexandria, Virginia and soon for BB/C. Those join BB/C's already up and running Twitter feed. Let's repeat that: 500 different bottled beers, 5(!) cask ale lines, a reserve bottle list, and 3 different serving temperatures for lighter vs. heavier vs cask beers. Throughout school and up until this point in my career, the focus has solely been on pairing food with wine, and while I love wine, I’ll let you in on a little industry secret – chefs drink beer. Look for an October opening at 1337 14th Street, NW, in Washington, D.C. When open, BB/C will be the 9th location of the Neighborhood Restaurant Group (NRG). There's more at Washington City Paper and Beer in DC. Earlier stories from YFGF here and here. Caveat lector: I might refer to BB/C's marketing as web-savvy, but because Rustico is a client of mine, I'll leave that determination up to my readers. I sell beer and wine as a representative for Select Wines, a wholesaler in northern Virginia. "Denver is the Napa Valley of beer," said Denver Mayor John Hickenlooper in his welcoming remarks at the Great American Beer Festival. http://www.gabf.org/. Northern Virginia Tweetup (meeting of Twitter users): Dogfish Head Alehouse in Chantilly, Virginia on September 30 at 6PM: http://bit.ly/zijfk Use the hashmark #NoVaTwtUp on Twitter. FollowFriday on Twitter: Two brewers at the Great American Beer Festival. From the East Coast: Bill Madden @MadFoxBrewing. From the West Coast: Greg Koch @StoneGreg of Stone Brewing. Austria is marketing its wine as a good pairing with the flavors of Asian cuisines. From Chicago Tribune: http://bit.ly/gSZKx. French government disavows its own earlier study promoting abstinence. Now, it says "moderate" drinking may have "positive aspects". http://ow.ly/qAhl. 70 years later Toto and Dorothy are still "not in Kansas anymore." The film 'The Wizard of Oz' is re-released, remastered: http://bit.ly/Ci5Ht. Yesterday afternoon, I was furiously re-Tweeting DC/MD/VA results from the Great American Beer Festival (GABF), as they were being announced. The live Twitter feed provided by the GABF failed part-way into the roll call, so I relied instead on Beernews.org who somehow managed to keep up, typing in names and awards, as they were announced, without advance notice. So, how did the region fare? Out of 78 categories: 15 medals and one major award. Flying Dog Brewery of Frederick, Md. and its head brewer Robert Malone, were recognized for a stellar performance, receiving the award for Mid-Size Brewing Company and Mid-Size Brewing Company Brewer of the Year. Putting it another way: of all the breweries in the United states, producing between 15,000 and 2,000,000 barrels of beer per year, Flying Dog has been recognized as the most proficient ... until next year, that is. The brewery's Dogtoberfest —its Märzen lager— won gold for the second year in a row. Clipper City Brewing of Baltimore, Md has now had its MärzHon win a medal for four consecutive years in the Vienna lager category: one gold, one silver, two bronze. Congratulations to head brewer Ernesto Igot and staff. 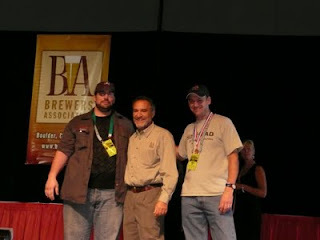 Clipper City Brewers Chris Farley (l) and Chris Mallon (r) flank Charlie Papazian (c) of the Brewers Association. Just late last year, Jason Oliver commenced brewing operations at new Devils Backbone Brewpub in Wintergreen, Va. Now, only a few months later, he has received four medals. That's a remarkable achievement for a new brewery. It's a testament to his brewing skills, as much as to the categories themselves, all lagers, more difficult, generally speaking, to brew well than ales. His showing pushed the state of Virginia's medal count to eight, compared to only one in 2008 and two in 2007. (analysis by BeerNews.org). Maryland received 7 medals. Congratulations as well to Chris Rafferty —brewer at Rock Bottom in Ballston, Va., to Tom Flores and Maggie Lenz —brewers at Brewer's Alley in Frederick, Md., to Mark Thompson and his crew at Starr Hill in Crozet, Va., and to DOG Brewing of Westminster, Md. A list of all the winners here. My apology is offered to Flying Dog's brewmaster Robert Malone. I bolloxed his name in my Twitter feed. Caveat lector: As a representative for northern Virginia wholesaler Select Wines, I sell the beers of Clipper City and Flying Dog. Aargh! Missed it by 7 days. September 19th was International Speak Like a Pirate Day. Actor Robert Newton, who portrayed Long John Silver in the 1950 Disney film Treasure Island and then in the 1954 film Long John Silver, is described as the "patron saint" of Talk Like A Pirate Day. Newton was a native of Dorset, and it was his native West Country dialect, which he used in his portrayal of Long John Silver and Blackbeard, that has become the standard "pirate accent". The pirate lass above was stylin' with a Heavy Seas (Clipper City Brewing) eyepatch at the August 2008 Brew at the Zoo at the National Zoo in Washington, D.C. The annual outdoor festival is a charity fundraiser, organized by the Friends of the National Zoo (FONZ), featuring the beers of over 20 breweries and food from as many restaurants. Take me out to the brewpub ... at a Virginia ballpark? The Lerners couldn't (wouldn't?) get it done at Nationals Ballpark in Washington, D.C., but officials and developers in Loudoun County —a suburb of Washington D.C., in northern Virginia— may. The Kimcora Village development, to be built at Routes 28 and 7 in suburban Washington, D.C., will be a mixed-use development anchored by the new 5,700-seat ballpark, slated to open for the 2011 season. I wouldn't call a brewpub in a ballpark a 'quirky feature'. More like: it's about time. Traffic is already atrocious in that area, roads and flow patterns insufficient to handle the volume. With all the additional traffic that this development will engender, one might appreciate a good beer. I was alerted to this breaking news by eagle-eyed David Turley at Musings Over A Pint. VeggieDag has been on a summer sabbatical. The first Thursday of autumn might be a good time for a return. So, here. October will be the third annual Vegan MoFo, that is, the Vegan Month of Food. For the entire month of October, blogs from all over the free world and Alaska will be writing about vegan food and the awesome power of veganism. Vegan MoFo started in 2007, when Isa Chandra Moskowitz thought it'd be a good idea to give NaNoWriMo [National Novel Writing Month] some stiff vegan food related competition. Since I still haven't managed to read all the MoFo posts from last year, I suggest you buckle up. For seriously, this year's MoFo's shaping up to be more gigantic than last, and the single most common denominator amongst serious vegans is an unending-giant-love for pontificating about vegan chow. You know it's gonna be wordy. Go to Kittee's blog to list your blog. Go to the Vegan Mofo Flickr group to post your photos. By the way, beer is a fine vegan foodstuff (and, yes, wine too). Every day at Yours For Good Fementables.com is meatless. On an occasional Thursday, I'll blog about that —as inspired by Veggiedag in Ghent, Belgium. Keeping with the 'good fermentables' aspect, I'll often inveigle beer or wine (or spirits) into the posts. The September equinox brings the first day of fall for residents of the Northern Hemisphere. The official start of fall occurs at 5:18 p.m. EDT on Tuesday, September 22. The astronomical start of fall means that Earth is no longer tilting the northern half of the globe toward the sun. Instead, the sun is directly over the equator. It has moved from a more northerly location in the sky and will be heading south for the winter. The equinox is often referred to as a time when the day and night is equal. This is not precisely the case. Day and night are quite close to being equal, more so than in summer or winter, but it would be more accurate to look at it as if the length of time for night in both hemispheres is equal. Existing somewhere between the light, refreshing offerings of summer and the richness and heavy spice of winter brews, fall beers provide the perfect seasonal transition. Malts take center stage. Hues get darker, matching the season's withering foliage. And overall flavors get heartier, preparing to hold their own against fall's thick stews, slabs of turkey and decadent wedges of pumpkin pie. Plus they offer a more flavorful alternative to throwing back cans of Budweiser and Coors on football Sundays (not that there's anything wrong with that). I might disagree with that final parenthetical clause, but, overall, it's a wonderful synopsis of why craft beer season begins now. That's Lanny Hoff of Artisinal Imports on the left. Appearance to the contrary, Lanny's one of the more genial and knowledgeable folk in the small-brewery import business. Here, he's deep in conversation with Casey Hard, the beer manager and cellarman for Maxs Taphouse of Baltimore, Maryland. The location was the Baltimore warehouse of Legends, Ltd., a beer importer and a beer wholesaler in Maryland and Washington, D.C. The occasion was the company's 4th annual Fall Trade Show, and its first since being acquired by the L. Knife & Sons Companies. The idea of such trade shows is to bring as many suppliers with as many of their products into one location at one time. That gives the managers of restaurants, bars, and shops a comprehensive opportunity to sample or see many of the beers and to learn more directly from the suppliers themselves. It's not generally open to the public. I was there courtesy of Legends' original owners and founders Patrick and Sherri Casey (who is in the above photo). 11% abv heather ale, aged in cherry-wood scotch whisky barrels. (They're not allowed to say which whisky, but onecan guess fairly easily.) It takes the delicate Fraoch into an entirely new dimension. Yeasty (I got the bottom of the bottle) but still refreshing with a nice cloviness. Fermented with hops and hibiscus. Very alcoholic, with a strong hint of honey and herbs. But because it wasn't sweet, I thoroughly enjoyed it. Only took one sample though. 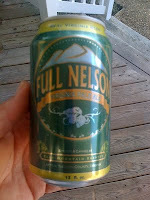 As importer Brian Ewing was telling me about this fine beer, I sensed the onset of a bit of carbonated indigestion. I covered my mouth, politely turned ... and let loose an unfortunate belch toward two young ladies I hadn't noticed standing behind me. Abashed would be putting it mildly. I apologized, several times. Looking at their name-tags, I saw that the two were Amy and Holly of The Black Squirrel, a good beer pub in Washington, D.C. It's a pub I haven't visited yet, but which I follow on Twitter (@ThBlackSquirrel). Laughing, the gracious duo invited me to visit the pub ... and to get burpy with it. As I type, it may be six in the morning here in the USA, but it's noon in Munich, Bavaria, Germany. There, Christian Ude —the city's Lord Mayor— is fulfilling one of his most important civic functions. Inside the Schottenhamel tent, he's tapping the ceremonial first keg of beer for Oktoberfest 2009. I won't be in Munich today. Instead, 6 hours later, at noon (Eastern Time USA), I'll be in Baltimore, Maryland, drinking from a wooden-tapped keg of German beer. Here's the beer list. It's subject to change: after all, the beer does have to travel 6,836 kilometers from Munich to Baltimore ... give or take. [UPDATE] Photos of Saturday's festivities here. Peripatetic Chuck Cook at Belgian Beer and Travel has written 30 entries for the upcoming book 1001 Beers You Must Taste Before You Die. It's part of a series of 'do this before you die'. Chuck has done quite a bit of travel to Belgium in search of good beer. The book is scheduled to be released in March 2010. The indefatigable Alexander D. Mitchell IV has had his Beer In Baltimore honored by the Baltimore City Paper as the city's "best drinking blog." No matter how much you love beer, we promise you it's not as much as this guy. For the past year and a half, Alexander Mitchell IV has been keeping us entertained and informed with his Beer in Baltimore blog, a frequently updated collection of short thoughts on beer--more nuts, bolts, and flavor than philosophy--news postings, and links. Sure, he dotes on Max's a bit much, but that's to be expected, and more importantly, this is a guy that just doesn't stop thinking about beer. We guarantee you'll get a whole new appreciation for it, too. More: The rest of the Best of Baltimore beer here. Apology: That's twice in a few days that I've appended the adjective 'indefatigable' to Mr. Mitchell's name. But, it fits. He's a hard-working guy. Proofreading: 'Kudos' is a singular, not plural, noun. It's September, and in the beer world, that signals the frenetic onset of beer festival season ... not that there aren't festivals all year round. The world's biggest beer party is Oktoberfest. It runs from 19 September through 4 October in the city of Munich, in Bavaria, Germany. The big kahuna in the USA is the Great American Beer Festival, back at its usual calendar placement, 24-26 September, in Denver, Colorado. It's sold out, but if you don't have tickets you still have many other options. As always, Bryce Eddings at About.com:Beer has published a fairly inclusive on-line list of beer festivals across the USA. Check it out here. For a much, much smaller list of just a few of the events in the DC/VA/MD area, check out my calendar —Where I'll Be— to the right, in the sidebar. 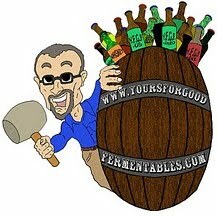 Yours For Good Fermentables.com will be attending and/or participating at several local beer festivals over the next couple of months. For good information on Virginia events, read the blogs Musings Over A Pint and Relentless Thirst. For Maryland: Kasper on Tap, Beer in Baltimore, BeerInBaltimore.com, Baltimore Beer Guy. For Washington, D.C., read DC Beer. From Fritz Hahn of the Washington Post on-line: Best Bets for Oktoberfest. In the past, Yours For Good Fermentables has examined beer volume measurements. It's due time for a look at wine metrics, courtesy Wente Vineyards. * A wine barrel in Burgundy contains the equivalent of 228 liters or ~ 60 US gallons. A Bordeaux wine barrel, however, is sized at 225 liters or ~59 US gallons. One US beer barrel equals 31 US gallons. One US bourbon barrel equals ~53 gallons. [The] Beer Institute released figures yesterday indicating that imported beer shipments were down another 8.1% in July, bringing year-to-date import shipments down 9.3%, or a loss of about 160,000 case equivs a day. There was some hope among import suppliers that sales would start to rebound toward the end of summer, but that just hasn't happened. A case equivalent is a conversion of barrels into cases (of 24 12-ounce bottles), as if all the beer produced by a brewery were only cases. 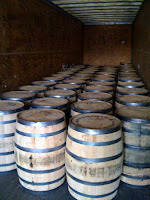 One barrel equals approximately 13.78 cases. Known in beer business jargon as a 'CE', it's a convenient measurement for some. The person who's drinking Amstel -- or any of the imported light lagers -- is often what marketers call an 'aspirational drinker.' They're drinking the brand because it sets them apart, and the higher price only reinforces that. Bud Light doesn't set anyone apart. <...> Some people really do drink more expensive beer just because it costs more, studies have proved this over and over. Ignoring for a moment the inanity of such marketing argot, the same 'aspiration' can be true of some wine drinkers as well, who will peruse 'ratings' of experts and the price tags on wine bottles, rather than trusting their own palates on the wine within. A Twitter welcome to @MadFoxBrewing: Falls Church, Virginia, brewpub to open in 2010. And, coverage in the Falls Church News-Press: http://bit.ly/mZEsS. #FollowFriday. 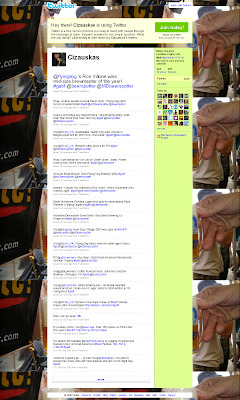 @BeerBizDaily: The Twitter feed from the website of the same name. The business of beer, of course. Room for beer education. Overheard at a bar: guy says he doesn't want a wheat beer, but he orders a hefeweizen. 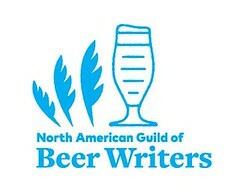 @agoodbeerblog opines on 'amateur' beer writing vs. 'professional' beer writing: http://bit.ly/Fairy. Could you call it a beer 'rave'? A trove of rare beers were poured at a event at a publicly 'undisclosed' location in Richmond, Virginia. Two stories: http://bit.ly/gLGS0 and http://bit.ly/nm8Z3. Organic peaches and 'grape' tomatoes from the Falls Church Farmers' Market. Scrambled Tofu (with cilantro and ranchero sauce). Coffee: Organic Papua New Guinea. The recipes for the tempeh 'bacon' and scrambled tofu were adapted from recipes in Vegan with a Vengeance. More photos and my recipe procedures here. Good Beer Guide editor Roger Protz said the nationwide total of breweries made the UK "undisputed top brewing country in the world". 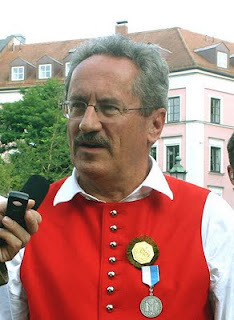 Canadian beer author/blogger Stephen Beaumont challenged the statement. He "ran the numbers." I was at pains to stress in media interviews that I wasn’t claiming that British beer is better than, say, Belgian, Czech, or German beer, but that the choice and diversity now available here is quite astonishing. Stephen Beaumont may live in Canada, but he writes, entertainingly and adroitly, about the entire world of beer. Read the full post from Blogging at World of Beer: here. What's the difference between a so-called 'craft' brewery and a so-called 'mega' brewery? The Brewers Association has a tortured definition: independent, 'small', traditional. The US tax code? It increases the marginal tax rate on 50,000 barrels or more if that brewery produces 2 million barrels or more. "The bill would reduce federal beer excise taxes to pre-1991 levels, when they were doubled. The bill seeks to reduce big brewer taxes from $18 a barrel to $9 a barrel, and rollback the small brewer tax break on the first 50,000 barrels from $7 to $3.50 a barrel." Britain has more small breweries than any other major industrialised nation, according to the Good Beer Guide. Large conglomerate breweries may say that they insist upon the 'best' ingredients, but as their goal is to maximize profits for their shareholders, 'best' might imply cost over quality. Maybe the defining difference between 'mega' breweries and 'craft' breweries is the latter's preference for quality over profit ... within reason! Every aspect is planned to the smallest detail, making Mad Fox seem less like a business and more like a science project. The glassware is carefully chosen so that each beer style is paired with the optimal drinking vessel. Ingredients are selected and imported based on their region rather than the price per unit. The recipes are always evolving, constantly being refined in order to obtain brewing perfection. Local Brew Master to Bring Award-Winning Lineup to F.C. Of course, don't take that too far. Non-conglomerate breweries are indeed businesses, and successful ones operate with good business practices. For example, Mad Fox brewpub has a business plan and 'crafty' investors. Boston Beer Company (Samuel Adams) sold nearly 2 million barrels of beer last year. It's the joy of the beer itself (and the joy of brewing the beer) and the sense of connecting with their community that separate small (or 'craft' or micro or local) breweries from their much bigger brethren. A barrel of beer is a measurement of volume equal to 31 gallons or 13.78 cases of beer. More on beer volumes and measurements here. Baltimore Beer Week —the first-ever— occurs October 8-18, 2009. The blog Beer in Baltimore has posted a very useful guide to lodging in the Maryland city, including special rates at two downtown hotels, and to transportation to and within the city. Lithuania was the last European nation to convert to Christianity. Of this, Lithuanians are not abashed. Many customs age-old remain, if latter-day filtered. These video-tours come from comedian Zane Lamprey. He toured Vilnius —the capital city of Lithuania— in search of its drinking customs. Lamprey found them: a pedal-powered mobile beer bar, a 19 year old brewer, Austijia (sp? )—a bodacious pagan goddess of hops, Ragutis —a well-endowed pagan god of brewers, and "Mak, mak" —a phrase you're apparently supposed to repeat when downing shot glasses of distilled roots and bark. Today being the first Friday of the month, it's time for The Session: Beer Blogging Friday. This month's topic was hosted by Peter Estaniel at his BetterBeerBlog: The Session #31: Summer Beers. With the summer coming to a close, what was your favorite beer of the summer? It doesn’t even have to be from this summer. Is it a lager or maybe a light bodied wheat ale? Maybe you’re drinking anti-seasonally and are having a barleywine or Russian Imperial Stout. Why is this beer your favorite? Is there a particular memory associated with this beer? How about a city? Maybe there was a particular dish that made this beer memorable? Spare no detail. Past Haitian dictator 'Baby Doc' Jean-ClaudeDuvalier was reputed to have thrown lavish soirees in the heat of the summer. Air-conditioning would be turned down to frigid temperatures, mimicking the cold of winter. Fireplaces would roar. Glamorous women would party wrapped in fur coats. YFGF wouldn't recommend such behavior —'Baby Doc' was deposed in 1986— yet drinking whatever flavor of beer appeals at whatever time of year is a natural thing. For instance, I posted last year in the heat of the summer about enjoying cask English barleywines and bottled US craft weizen dopplebocks: Just say no ... to lawnmower beer. Enjoying lighter styles of beer in the summer —lawnmower beers, if you will— is also fine and dandy. Refreshing as the beer might be, however, what it is not is rehydration. Alcohol is a diuretic. One of my special treats in past summers has been pouring Quelque Chose over crushed ice, with a splash of bitters. The beer —from the Unibroue brewery in the town of Chambly, in Quebec, Canada, and so pronounced as KEL kuh shows— is an oak aged pale ale, re-fermented with Canadian cherries. It ends up un-carbonated, 8% alcohol by volume (abv), and wickedly sour and complex, but not to the puckering dimensions of a lambic. On hot and muggy Washington, D.C. summer evenings, it has been the occasional treat: refreshing and unique. I use the past tense because this tale has a sad ending. Unibroue's Maryland wholesaler has informed me that Unibroue is no longer exporting Quelque Chose to the United States. My post is two days past due for The Session's Friday deadline. Go to BetterBeerBlog for the recap of those who did manage to submit on time. I don't recall why Watership Down was on the table in the photo, except that it may have been a relaxing read for the evening.